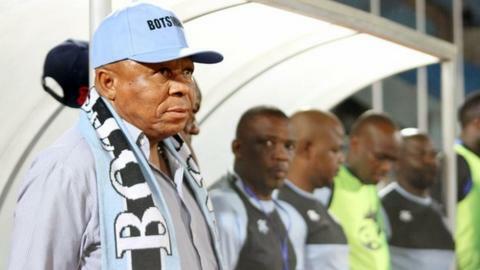 Botswana's Football Association confirmed the sacking of national coach David Bright on Wednesday. The Botswana Football Association (BFA) has sacked national coach, David Bright following the team's poor run in the 2019 Africa Cup of Nations qualifiers. The Zebras are left with one round to play, against Angola next month, but remain winless after five matches. Bright was appointed for his fourth stint in charge of the team in July 2017. BFA chief executive officer, Mfolo Mfolo confirmed Bright's departure in Gaborone on Wednesday. "We have done a thorough assessment of the team's performance. The introspection hinged on so many aspects," Mfolo told a press briefing. "The coach had a target of qualifying for the 2019 Africa Cup of Nations finals, it was one of the deliverables. "He was also expected to raise the profile of the team, by improving our [Fifa] rankings by 15 places. The opportunity was there to qualify [for the Nations Cup]. "We are now ranked 145, so it was only right that we part amicably with the coach," Mfolo said. Bright had said the association failed to fully support him in preparing the team for most of the assignments, which led to the decline in results. But Mfolo disputed Bright's claims. "You must know that national teams get their time during the Fifa week. Some countries only meet in the host country [for the game]. "Since I came to office, we have always ensured that the Zebras are engaged during the Fifa week," Mfolo added. Mfolo announced that the whole technical team, under Bright, has been dissolved, and a process to recruit new members will begin soon. He confirmed that the Zebras would be under an interim coach for their next match. "There is no time frame, as to when we will hire a substantive coach, but we expect that to be done by June. In the meantime, there must be someone to prepare the team for the Angola game." Bright, who succeeded Englishman Peter Butler as Botswana's coach, found the going tough after failing to go past the quarter-finals of the regional Cosafa Cup in 2018, before their barren run in the Nations Cup qualifiers. Botswana are in Group I alongside Burkina Faso, Angola and minnows Mauritania, but have so far managed to gather only one point in five matches. How can Botswana rekindle 2012 fortunes?